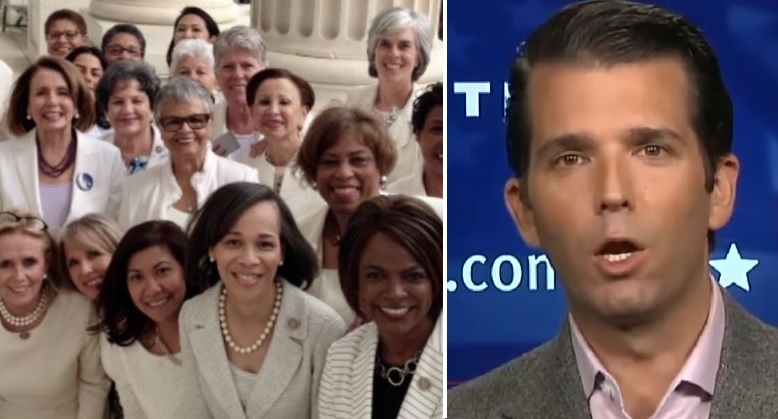 Donald Trump Jr. launched an attack on the group of Democratic congresswomen who wore all-white ensembles to make a striking visual statement about how the Trump administration has handled issues important to women, from health care to equal pay. “Speaks for itself and no one is at all surprised,” Trump Jr. wrote in the tweet alongside the photo. “Treason is serious Junior,” he added. The journalist also shared a photo of Trump Jr., his siblings Eric, Tiffany and Ivanka and their partners at the SOTU last night, appearing to show that none of them were wearing an American flag pin. Mueller just received the official copies of the transcripts of you perjuring yourself to Congress. Make sure you wear your flag pin to bed. The FBI knocks super early. The largest contingent of women in Congress celebrates by wearing the color that symbolizes our right to vote, participate in and affect change in this country. Let’s focus on the pin though.